Big performance in a small package, the TC 85 features the highest technology available in Motocross, and delivers it in style. Nimble and agile, the powerful little 2-stroke engine is equipped with a power valve and is fitted into a solid chassis that has been updated with a new swingarm and new tyres. Now more than ever, the little Husqvarna is ready for the top step of the podium. Cylinder: The high performance cylinder has flow-optimized ports and an exhaust control valve for top performance. Engine: The high performance 2-stroke engine on the TC 85 is fitted with a power valve to maximize the power band. The high performance cylinder has flow-optimized ports and an exhaust control valve for top performance. Reliable and efficient cooling is guaranteed by integrated crankcase cooling and two radiators. Cooling: Reliable and efficient cooling is guaranteed by integrated crankcase cooling and two radiators. Crank Shaft: The crank shaft of the TC 85 was optimized for maximum performance while guaranteeing durability. Swingarm: The single-component cast swingarm has been redesigned for MY15. It is now 0.5 kg lighter while maintaining the same structural characteristics. The new swingarm also features a redesigned chain guide, chain slider and brake hose bracket that increase safety and performance. The advanced production process eliminates welding and guarantees consistent behavior and quality. Gearbox and Clutch: The precision-engineered 6-speed gearbox is mated to a smooth and precise Formula hydraulic clutch. Rear Suspension: The PDS rear suspension offers stability, precision and rider comfort in extreme conditions. The shock features complete adjustability and can be setup to perfectly match rider preference and track conditions. Front Suspension: Completely adjustable WP suspension front and back for maximum performance on any track. The 43mm upside down fork with 270mm of travel has all the high quality characteristics of the full size Motocross models in the Husqvarna range. Wheels and Tires: Black Excel rims and new Maxxis tires deliver outstanding performance on a variety of terrain. The pattern design and rubber compound of the new tires deliver exceptional straight-line stability and excellent traction and predictability. The CNC machined hubs play an important role in keeping overall weight at a minimum. 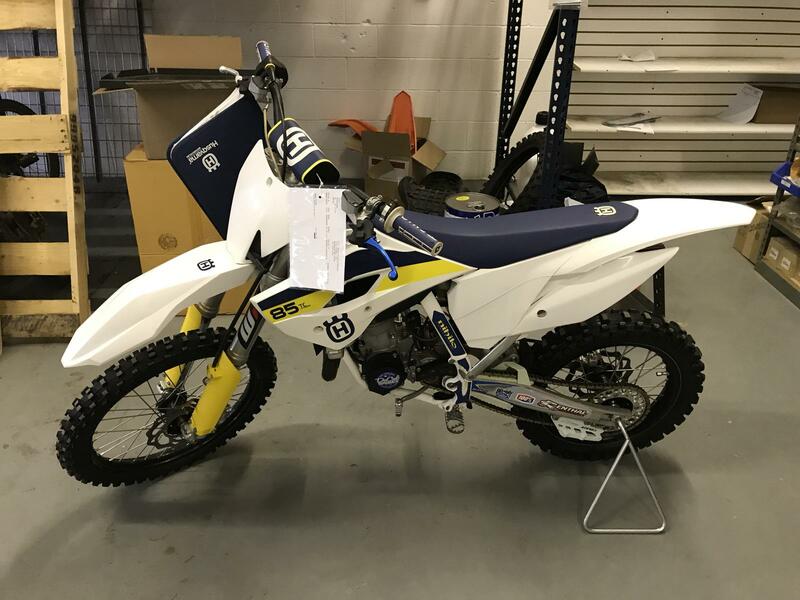 Distinctive Looks: Traditional Husqvarna white, blue and yellow adorns the newly designed Motocross range, enhancing the modern styling. Brakes: Latest generation Formula brakes offer superior stopping power and feeling, guaranteed by the cutting-edge radial, four piston brake caliper and 220mm Wave disc at the front, while at the rear a two piston caliper and 210mm Wave disc gives the rider complete confidence.